Uptown Kellogg from McKinley Ave.
"Founded by a jackass and inhabited by his descendants." Location of Kellogg in Shoshone County, Idaho. 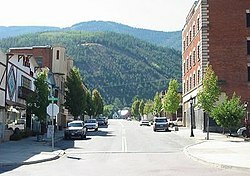 Kellogg is a city in Idaho in the United States. ↑ "2016 U.S. Gazetteer Files". United States Census Bureau. Retrieved Jul 26, 2017. This page was last changed on 21 June 2018, at 18:07.